It’s time for another major tournament, and with Euro 2012 kicking off in both Poland and Ukraine this afternoon, we bloggers are pretty much obliged to compile lists of predictions about what will transpire over the next month. euro 2012 starts off with a flowery-bang at the polish national stadium. Thousands of predictions have rained down from the blogosphere over the last two weeks, most of which concerning themselves with what nation will take home the trophy, which player will bag the golden boot, and how many polish sausages will be consumed by drunken Irish fans as they flock from city to city. And if you ask me, that get’s a little boring. Do I really want to be the 5327th blogger to choose Germany as my probable winner? No, especially if I pick the wrong team, giving all of you the ability to call me an idiot and hurt my feelings. And will my reasons for making said prediction really be that different from everyone else who’s written about it so far? Probably not. Another major tournament, another major French-squad disaster. While the 2010 World Cup finals saw the team boycott a training sessionand eventually Nicholas Anelka sent home, this year’s blow up was far more catastrophic. With so many so many big-headed players — Ribery, Nasri, Evra and Koscielny (I kid) — the squad will actually collapse under its own weight like a black hole, crushing the players, the coaching staff and a handful of the members of the press to death. Initial reports out of France suggest that most of the population is only upset because Ramond Domenech was not still the manager, thus avoiding death by black hole. 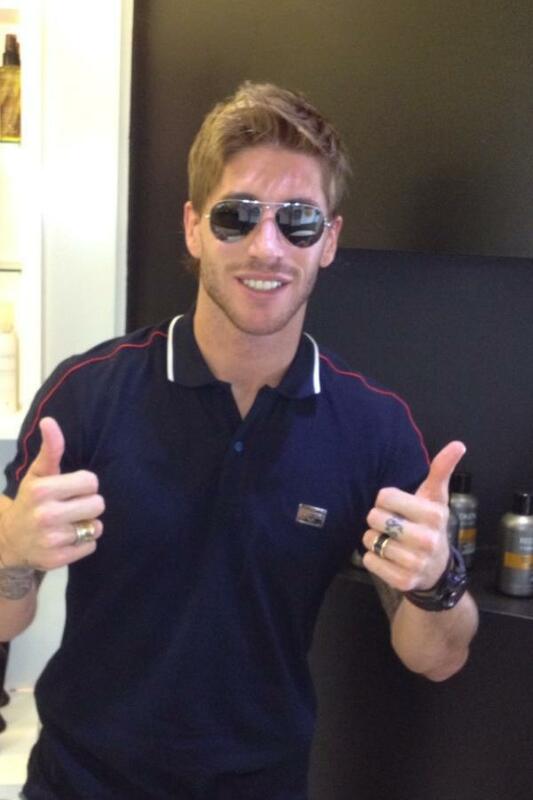 sergio ramos cutting his trademark hair before the tournament seems like a bad omen for the spanish. Sergio Ramos recently visited a stylist — there’s no way he visited a barber considering the hair he’s sported over the last 10 years — and cut off all of his hair. Like Samson’s famous locks being chopped before him, this will be the downfall in Spain’s title defense, not Barça/Real infighting or player fatigue. Galvanized into rapid maturity by the mere threat of not being able to see Mario Balotelli play a full match if they racially abused him, Polish and Ukrainian fans shockingly abstain from hurling insults at minorities on the pitch. However, the tournament does not go down without any racial incidents. Unsurprisingly, John Terry is suspended for the remainder of the tournament after video evidence surfaces that he repeatedly called France defender Patrice Evra “negrito”, despite trying to justify it by explaining that name was kosher and non-offensive in East London while he was growing up. Nicklas Bendtnar will win this year’s golden boot… well, at least that’s what he’s told all of his friends. And any pizzerias that won’t serve him since he doesn’t have his wallet. 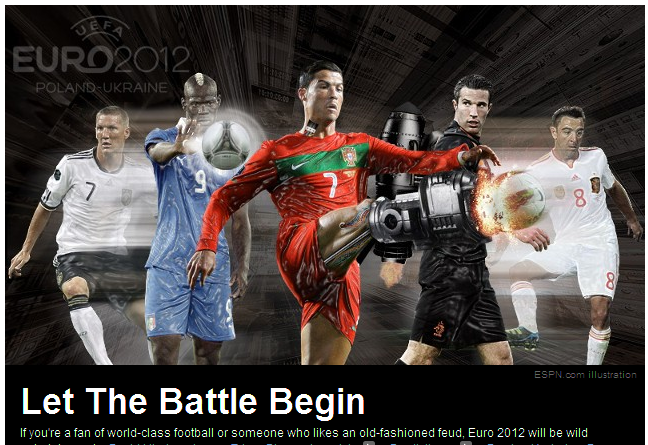 thanks to espn, i know now that ronaldo and van persie are cyborgs, balotelli is magneto, and that schweini and xavi are… blurry? ESPN’s launch of their brand-spanking-new ESPNFC.com (which, by the way, still doesn’t work in Chrome) kicks into overdrive with the tournament beginning today. And with that, we’ll be treated a lot more horribly shopped pictures gracing their front page — such as the one to the right. And from what I can gather, the head honchos in Bristol, Connecticut, have decided that star players in the tournament are actually X-men. The Greek national team — Cinderella champions back in 2004 — are unable to escape the austerity measures that also grip their homeland, meaning they’ll be forced to scrounge for table scraps and root through dumpsters to feed the squad throughout the tournament. Due to the poor nutrition, Georgios Samaras’s flowing locks lose their natural luster, thus further depressing the Greek fans back home. Wayne Rooney, Ashley Cole and Jermain Defoe make a bet with one another to see who can sleep with the most prostitutes during their time in the tournament. Each bags impressive numbers, with many high fives traded amongst them throughout the challenge. However, the only winner in the bet? Chlamydia. Scandal has once again gripped the Italian national team ahead of a major tournament, with seemingly more and more players and coaches being accused of match fixing and betting scandals by the day. The trend will continue during the Euros, with the squad eventually being fingered for paying off not only match referees, but also hotel bar staff, massage therapists and bellhop. 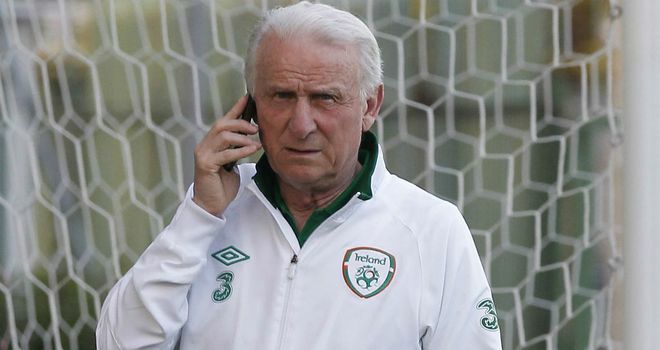 Ireland coach and fellow Italian, Giovanni Trapattoni was originally confronted after his Irish side lost all three matches — some thinking they had thrown the matches — but everyone eventually realized that they just sucked that bad. Will any of these come true? Well, we’ll just have to wait and see.